The cabin comfortably sleeps 4 people on a fold-out futon bed for two people and a double bunk bed for another 2 people. This cozy log cabin sports an open concept with table and chairs, shelves and cabinets to provide lots of space for your gear. Windows along two sides allow for a fantastic view of the back country and "King's Throne" summit. The kitchen area is separated by a counter from the living area. It comes with all the necessary kitchen equipment such as pots and pans, cutlery, water containers and dishes as well as a 2 burner propane stove. With no running water we supply 20 liter water canisters which are set up in the kitchen area. There are propane lights and two battery operated LED lanterns and a wood stove to heat up the cabin easily. The snug outhouse serves as your bathroom facility. An outside earth cooler keeps your perishables and drinks in top shape. Right behind the cabin a campfire setup with log seats and benches and firewood allows for memorable evenings outside. CAD$125.00 + 5 % GST for 1-2 people per day. CAD$150.00 + 5 % GST for 3-4 people per day. 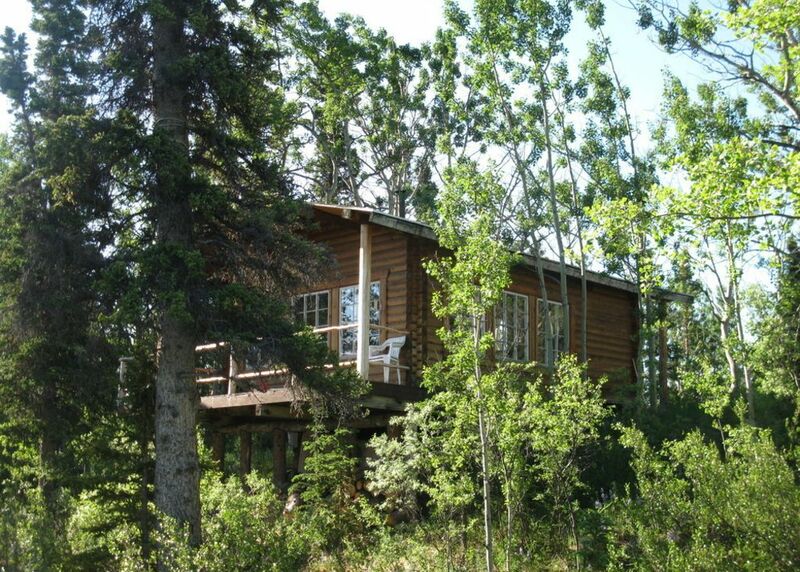 Right at the feet of famous Kluane National Park, this cozy log cabin is nestled between spruce trees and cotton woods. A short walk from the Alaska-bound Haines Highway you will find ample space around the cabin and endless wilderness right behind it. Forested trails and grassy meadows, not only invite moose, coyotes, bears and other native inhabitants, but will lead you into some amazing, untouched northern back country. Deep blue Kathleen Lake, the high country of St. Elias Mountain Range, and the remote valleys of the Cottonwood Pass are only minutes away. Right across from the cabin is the famous Kluane National Park, a world heritage site and wilderness protection area of over 22.000 square kilometers established by the UNESCO. Trails and old mining roads lead into an amazing back country full of wildlife and lovely flora. Canada's highest mountain, Mount Logan can be seen and explored on a nearby available glacier flights and helicopter tours. Also best observed with planes is world's largest non-polar ice fields, which nestles itself into the back layer of the famous St. Elias Mountain Range. Hiking, canoeing, or guided horseback or rafting trips can all be arranged in Haines Junction, the next village, 25 km from the cabin. Fly fishing is great at nearby lakes and rivers. And if you are a enjoy-it-yourself person, uncountable trails are there for you to explore, from 1 hour to full day hikes, easy to adventurous, with breathtaking views and always the possible wildlife encounter. A small library in the cabin not only lends itself to entertaining hours at the wood stove or camp fire, it also offers educational information about the area, flora and fauna, history and what to do when actually meeting a bear. We strive to prepare each guest to the very best prior to coming out to this amazing wild place with a personal meeting talking about anything that seems necessary. 25 years of wilderness guiding experience trained us to comfort and help many visitors to enjpy this place and time to the fullest. CAD$ 700.00 + 5 % GST for 1-2 people per week. CAD$ 800.00 + 5 % GST for 3-4 people per week. CAD$125.00 + 5 % GST per day.